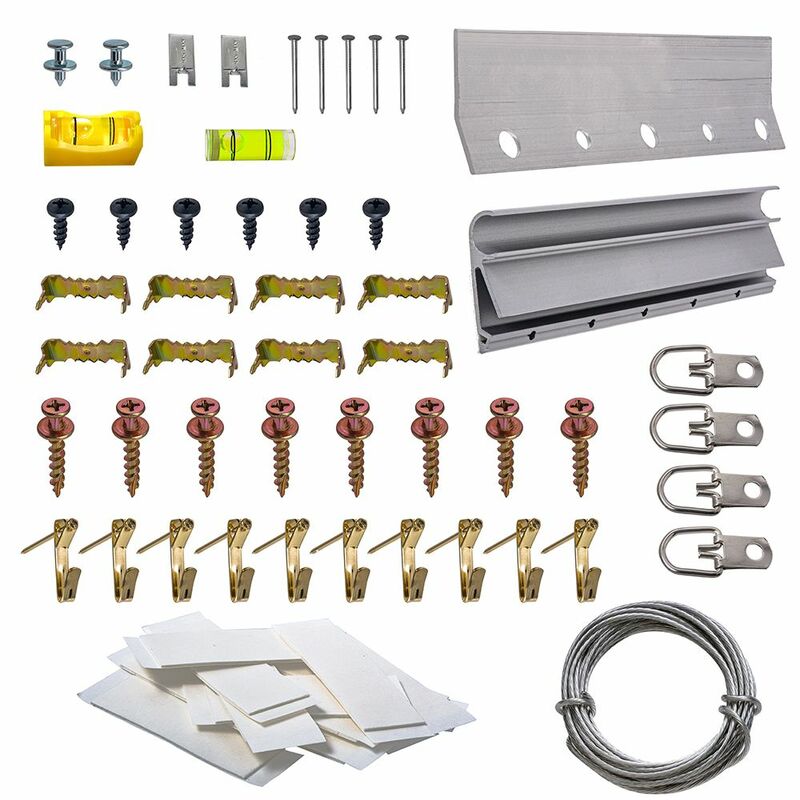 71 piece kit has everything needed to hang a variety of over 20 items. It's great for hanging posters, maps, crafts or any other light weight item with a flat back. Includes 12 tabs of poster tape, 1 5" heavy duty hangnail, 8 Bear claw Hangers, 4 locators (for d-rings, sawtooth and keyholes), bubble level, 8 sawtooth hangers, 10, 20lb. hangers and nails, 4 small d-rings with mounting screws and a 9' spool of wire. The Top of Door Strap Barn Door system features a classic face mount flat strap to hang wood doors on a traditional rail track. The large wheels provide excellent strength and durability as-well-as smoothness of travel along the track. Command Picture Hanging Strips work on a variety of surfaces and make decorating quick and easy. One click tells you that the Command Picture Hanging Strip is locked in and holding tight, and when you are ready to take down or move your pictures, they come off without damaging your walls with nail holes, cracked plaster or sticky residue. The Command Picture Hanging Kit contains an assortment of Command Picture Hanging Products in a reclosable kit for easy storage and organization. Always have the products you need to quickly and easily hang your dicor or even create a custom gallery wall! Best of all, when you are ready to take down or move your pictures, they come off cleanly without leaving any nail holes or sticky residue. Make hanging lights outside easier and safer with the No Ladder Quick PRO 11 ft. Light Hanging Kit. Simply attach your light string to a clip, snap the clip onto the 11 ft. pole, then extend and snap into place directly onto your gutters, shingles, or eaves. Power it up and you're done. Picture & Poster Hanging Kit 71 piece kit has everything needed to hang a variety of over 20 items. It's great for hanging posters, maps, crafts or any other light weight item with a flat back.